Photos soon! Excellent color combination of moonlight white pearl exterior with wheat leather interior. Premium package includes: pwr tilt/sliding tinted glass moonroof w/one-touch open/close, sliding sunshade, Bose premium audio system w/AM/FM radio & CD/MP3 player, radio data system (RDS), (10) speakers, drivers audio stage, 2GB Music Box, driver seat memory, exterior mirror memory, pwr tilt/telescopic steering wheel w/memory, entry/exit assist and rear sonar system. Navigation package includes: Infiniti hard drive-based navigation system w/touch screen, lane guidance, XM NavTraffic w/XM NavWeather, Zagat Survey restaurant reviews, voice recognition system, Bluetooth audio, 9.3GB Music Box hard drive, digital video playback capabilities and DVD-video playback. Keyless entry and pushbutton start. Heated front seats. 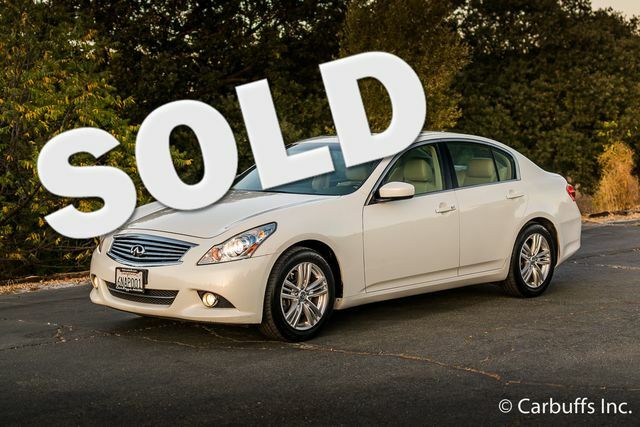 Bay area car since new with excellent dealership service history including the recent 90k service at Infiniti of San Francisco. 91k miles. Clean title and carfax report. A few bumps and bruises from city parking but is an excellent car in all areas. Please call for business hours and vehicle availability as not all vehicles are on site at the dealership.